We decided to skip Dinosaur National Monument this time around and head straight to Canyonlands. Dino is operating under some restrictions due to the visitor center being closed, and the fact that it is off-season. We’ll visit that park on another trip. So our route took us down from Blue Mesa reservoir along Rt 50/285 to Montrose, and then northwest to Grand Junction CO, where we picked up I-70 to Utah. As I’ve mentioned before, the drive along Rt 50 across Colorado is a fantastic and worthy roadtrip. I-70 from Denver to Grand Junction is pretty good (for an Interstate highway) as well, but given the choice I’d pick Rt 50 except in winter. I can’t say the same for I-70 west of Grand Junction, because as soon as you cross into Utah it becomes a pretty featureless and dull road. The compensation is that you’re out of the mountains and on the straightaways, and so you can go fast. 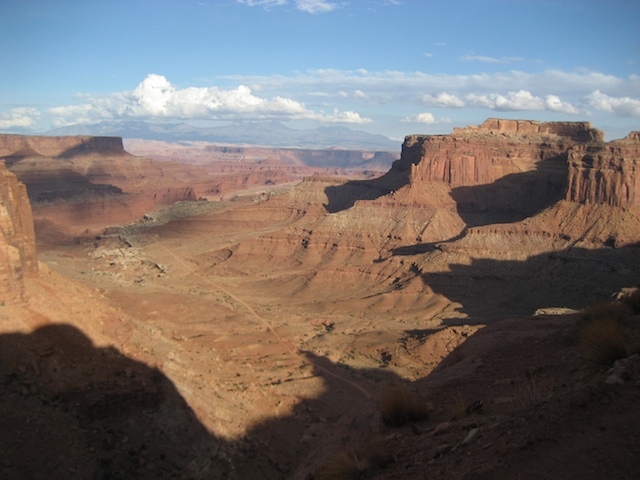 The entrance we used to Canyonlands National Park is just north of Moab UT. The park is divided into four districts, each separately accessible: Islands In The Sky (where we are), Needles, The Maze, and Horseshoe Canyon. The districts have completely different routes leading in, and this makes it virtually impossible to visit all of the districts in less than a week. The distance from one entrance to another can be several hours. We chose Islands In The Sky for its accessibility and features — it should be a good orientation to the park overall. We’ll have to visit the other districts in future trips. You have to come prepared to visit this place. Visually, it is like a mashup of Bryce Canyon and Grand Canyon. The views are stunning. But there is no lodging, no water, no fuel, and no services (restaurant, repair, or otherwise). The only campground in this district is called Willow Flat and it has just 12 sites. It fills every day this time of year. It has no dump station or water either. For just about anything, you have to drive 25-30 miles to Moab along a circuitous (paved) road, which means a minimum 45 minute trip one-way. We arrived at 3 p.m., far too late to get a campsite in either Willow Flat or the nearby Dead Horse State Park (just outside the park boundary). We ended up at a Bureau of Land Management campground called Horsethief, about 5 miles from the park. No water, no dump, no hookups, but nice scenery and well-spaced dirt sites in the boonies ($12 per night). 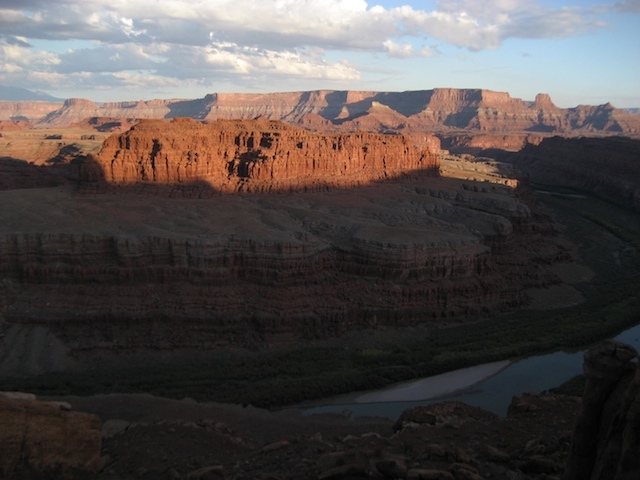 Amazingly, my cell phone and Internet work just fine both here and at the Canyonlands visitor center, so I’m able to keep up on work and post the blog. That means we’ll stay at least two nights and perhaps three. Our usual program when arriving at a national park is to drop the trailer and immediately hit the visitor center for orientation. The rangers are always happy to meet someone who is going to stay a few days (rather than the usual, “We’ve got two hours — where are the good views?”) and they will provide insider tips on where to go. I wouldn’t take it on major 4WD roads that require very high clearance because our hitch reinforcement would probably scrape, but the Shafer Trail looked like a good bet — and if it wasn’t, I was prepared to turn around or back up, and go home. Well. I was pretty busy trying to observe the incredible, occasionally terrifying, view while driving the car around steep hairpin turns over loose rocks … so I did not get any photos of us coming down the road. 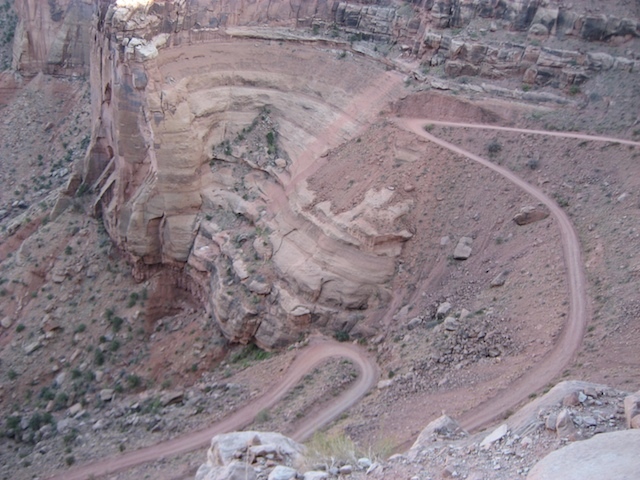 However, you can get a good idea of what it is like to drive the Shafer Trail from videos taken by other visitors. The photo at above (click to enlarge) shows part of the descent we did. The car did just fine, had no clearance problems, and handled as well or better than the Nissan Armada we used to do these sorts of things with. So I’m amazed that Mercedes managed to engineer a car that can go 150 MPH all day on the Autobahn in comfort, tow a heavy Airstream with good fuel economy, and still be a capable rough-road vehicle too. The trip down Shafer Trail takes a while. We put the car in “Downhill Speed Regulation” mode, set the limit to 6 MPH, and it crept down the hairpins while I tried to avoid sharp rocks and major potholes. 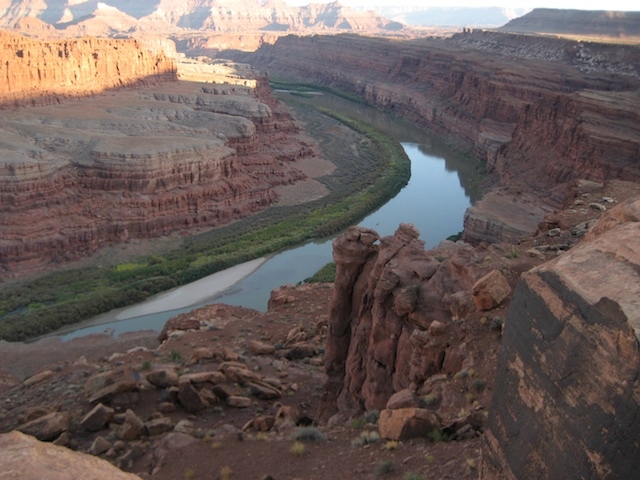 In about 40 minutes we were down to the Gooseneck hiking trail, parked the car, and hiked 0.3 miles to a stupendous overlook of the mighty Colorado River grinding its way through the sandstone canyon. Yes, it was worth the trip. I would have liked to have gone farther, but the setting sun dictated that we head back up. I could not imagine driving the Shafer Trail in the dark. At Gooseneck, the road we were on was part of the White Rim Trail, which is a backcountry 4WD adventure of over 100 miles. It takes at least two days to traverse completely. I am sure there are parts of that road I wouldn’t have taken our car on, but the rangers indicated that if we had time we could have gone at least to Musselman Arch. Today we are going hiking. I have the Winter 2009 magazine 95% wrapped up, and my major task in the next few days is to review layouts and resolve last-minute problems before we go to press. This is work that can be done at any hour of the day, which means we can play in the sunshine and I can work in the early morning and at night. It makes for a long and peculiar day, but it works for me. I see the kid is waking up now, and that means it is time for me to wrap up the morning’s work and start preparing for a day in Canyonlands. We spent last night parked near a Mercedes dealer, Feldmann Imports, in Bloomington. One parking lot is pretty much like another, but we were in this particular one because we were the guests of honor at an informal gathering of Mercedes owners from the Twin Cities area. There is a Mercedes Club of America (MBCA) with local units all over the country, and the leadership of this particular unit got wind that we would be in the area. So they invited us to join their members to talk about towing with a Mercedes — a rarely discussed subject indeed. At this point we have 10,000 miles on the GL320 and it was time for the first scheduled maintenance interval, during which the dealer basically does an oil change with a lot of inspections, and refills the AdBlue (urea) tank which for the Bluetec emission system. This made it convenient to stop at Feldmann’s in the morning, unhitch the trailer in the overflow parking lot, and get serviced while working comfortably in the Airstream. For those interested, the AdBlue tank required 4.5 gallons of fluid, which is about half the capacity of the tank. This is despite about 7,000 miles of towing and 3,000 miles of general purpose travel. So we have proven that even with a high percentage of towing, I don’t need to be carrying spare bottles of urea around between service intervals. We’ll have another service at 20,000 miles and the AdBlue tank will be flushed and refilled at that time. In the afternoon we had a couple of hours to zip over to the famous Mall of America (just a few miles down the road), just to say we’d done it. If you like malls, this is heaven, and if you hate malls, well … it’s hell on earth. Like most things, it is what you make of it. One nice perk is that you can buy a Caribou Coffee and then walk around the mall getting free refills at any of the other Caribou Coffee outlets, which are everywhere. That, of course, was all Eleanor needed to know for her bliss. We didn’t have time for shopping and we didn’t really need anything, even from the “Barbie Store”, but we walked all three circular levels of the mall just for the exercise. Then we ruined any possible benefit of that exercise by pigging out at Dave’s Famous Barbecue. Overall, I think that’s a net win. The MBCA meeting was held in the parking lot beside the Airstream. Imagine about a dozen people milling around in a parking lot with a few distance sodium lamps providing dim light, all excitedly talking about Airstreams, travel, and Mercedes cars. Beside us the representative from Feldmann’s set up a table with desserts and drinks, and of course each of the members showed up in their Mercedes. This group is a lot like the Airstream’s WBCCI group in age and obsessiveness, and like Airstreamers they own everything from vintage to new (and often several of both). Airstreamers aren’t all millionaires, despite what people think, and the same is true of Mercedes owners. The ones we have met have turned out to be very nice and very dedicated to their cars, even the old clunkers. Speaking of clunkers, the other noticeable element in the parking lot was several rows of older SUVs, pickup trucks, and minivans. These are the remnants of the “cash for clunkers” program, and all are destined to be scrapped under the Federal guidelines of the program. They were a pretty rough-looking bunch, especially when contrasted with the new Mercedes and Nissan cars being unloaded nearby. We’re on the way out of town now, heading for a quieter spot for a few days, so we can catch up on work, laundry, groceries, and homeschooling. It looks like the SPAM Museum will not be on our route after all, due to limited camping opportunities in the area. We’re moving west again …. OK, since things have settled down and we’re in relaxation mode, I can give the vehicle report for the gearheads. 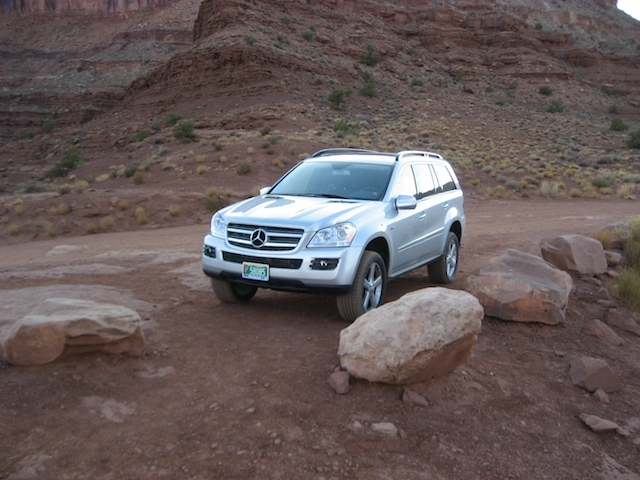 As you’ll recall, we switched from a Nissan Armada to a Mercedes GL320 a couple of months ago. This trip from Arizona to Vermont was the first big trip with the combination. The trip was an ideal test for the new vehicle, since it encompassed virtually every condition we expect to tow in routinely: mountains, windy plains, cities, curvy back roads, and deadly boring Interstate. It also included a mix of towing and non-towing use. That’s important because we chose the GL320 partially for its non-towing driveability. In other words, I wanted all the performance we’d get from a bigger vehicle, but didn’t want to be saddled with an unwieldy truck when not towing. We use our tow vehicle as our primary transportation for months, when we are on extended trips. Anyone reading this for advice should first read my initial report on the GL320, since I’m not going to repeat all the things I said there. There are significant caveats for anyone who might be considering this particular vehicle, or the essentially similar (but smaller) ML320. I am NOT writing this to convince anyone that they should buy this (or any) vehicle. I’m only documenting my experience. The right vehicle for you may be completely different. Our trip was about 4,000 miles, mostly highway. The GL320 turned in about 12.5 MPG in the first 2,000 miles while towing, then the fuel economy improved markedly, between 14.0 to 15.2 while towing at 60 MPH. Going 65 MPH costs us about 1 MPG. Non-towing fuel economy has been superb for a vehicle of this size: 22 MPG in mixed driving, and 25-27 MPG on the highway at virtually any speed up to 75 MPH. At this point the odometer shows 5,400 miles total. We have not had to add oil or AdBlue to date, despite the fact that most of our mileage has been towing and the engine is probably still breaking in. The AdBlue tank is scheduled to be refilled by the dealer at the 10,000 mile scheduled service interval, and I am interested to see if it gets low before then. AdBlue consumption is related to fuel consumption and of course we use more fuel when towing. The Bluetec system is a relatively new technology and there are reasonable questions about how whether the standard AdBlue tank is large enough to accommodate lots of towing. Mercedes says it is. Performance has been spectacular. You would never know that this is a 3.0 liter V-6. We have more pulling power (torque) than even the big 5.6 liter V-8 in our Armada. Up hills, it blows the Armada away, and despite having 7 gears in the transmission, it needs to shift less on hills because of the impressive torque. Most of the time we are towing in 7th, with occasional shifts down to 6th and rarely 5th on moderate hills. That’s with the full 7500# load that the car is rated for. I am sure the engine is capable of much more. We have yet to find the top speed (and probably never will), but in west Texas on I-10 where the speed limit is 85 MPH, it felt capable of every bit of that. I personally never tow over 65 MPH for sustained periods, and usually keep the cruise control set around 60-62 MPH for best economy. I am very interested to see the high-altitude performance, since that’s where we always struggled with the Armada. The normally aspirated gas engine lost a lot of power at altitude (like in Colorado and Utah), where the turbodiesel should do much better. But the performance of the turbodiesel is apparent even on flat plains because a headwind on the Interstate can be just as tough to deal with as an 8% grade in the mountains. The brakes are also impressive. The GL320 has 14 inch vented discs front and rear, again bigger than the Armada’s, and there’s no doubt in my mind that the brakes are up to the task of stopping both truck and trailer if they have to (in the event of trailer brake failure). I know a lot of people get freaked out by the word “unibody,” but it’s not true that unibodies are always weaker or less capable of towing compared to traditional body-on-frame trucks. In any frame, there are weak designs and there are strong ones. The GL320 has an extremely strong unibody structure with lots of high-strength steel. During the trip we never heard so much as a creak from the body, nor any indication of unusual flexing. Tire wear has been normal thus far. Every engineer I talk to says the same thing, “Unibodies are often stronger than ladder frames.” I’m very comfortable with the vehicle structure but of course the proof will be a few years down the road. My major beef with the car has been the completely hopeless hitch receiver that Mercedes put on it. We reinforced ours in Tucson, which probably would have been enough, but then for added long-term durability I let Can-Am RV do their preferred reinforcement on it as well. It is now very strong and distributes the stress of the hitch weight over much more area. The Can-Am RV crew also changed the Hensley shank from a 2″ drop to a straight shank. For our combination the 2″ drop bar was better for keeping the trailer level, but the straight one was recommended for slightly more weight distribution to the front axle. I don’t if it was the new shank or the stiffer receiver, but when we weighed after the modifications, we had an additional 200 lbs on the front axle (and the same amount less on the rear axle). This improved the ride slightly, and handling remained about the same (which is to say, very good). The only problem with going to the straight shank is that the back of the trailer now rides about 1″ lower. We already had problems with the back occasionally scraping the road when we entered gas stations, and this makes it slightly worse. I may switch back to the 2″ drop this fall if my experience is not good. Handling-wise, there is still the usual SUV “squishiness” in the tires. I felt this in the Armada as well. The recommendation I’ve gotten is to change to a tire that more closely matches the width of the rim. The rims are 8″ wide and the tires (275mm wide, or about 10.8 inches) overhang them by quite a bit. I may try this when the stock tires are worn out. I’m also still unimpressed by the lack of a spare tire. It may be possible to shoe-horn a spare into the usual trunk space, but in any case I’m carrying a tire plug kit and a CO2 tire inflator. I love this combination — it will fix 90% of flats and it all fits in hardly any space at all. If you are interested in buying a CO2 inflator from Power Tank, type “AirstreamLife.com promotion” in the Comments box on their order form and you’ll get a free tire plug kit worth $40 with your purchase. 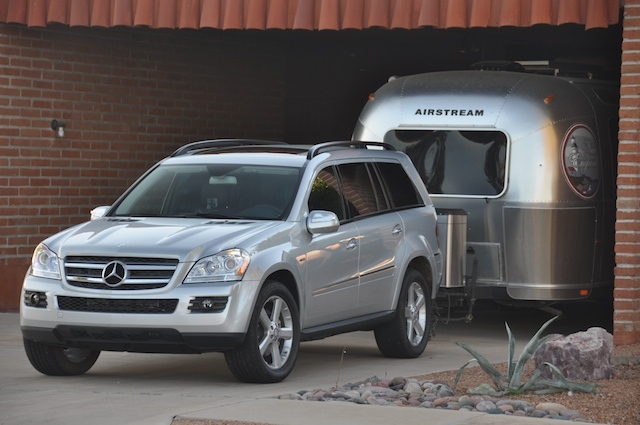 I’m also doing a review of their product, which will appear in the Fall 2009 Airstream Life Online Edition. It should be apparent by now that I like the turbodiesel. As I’ve said, the engine is most of the reason I bought this vehicle. It is astoundingly quiet, well-mannered, and the exhaust is so clean you can only tell it’s there by the warm steamy air. Can’t smell it, can’t see it. None of the diesel traits of the bad old days are present. Most people can’t tell it isn’t a gas engine, until they stomp on the accelerator and it leaps forward with a different (but quiet) sort of engine rumble. I wish there were more options to get these engines. In Europe they’re everywhere, but in the US/Canada there are few available. As a result, today’s options for V-6 diesels mostly come from the European manufacturers: Land Rover, Mercedes, Volkswagen, Porsche, Audi, BMW. (If it bothers you to buy a “foreign car,” keep in mind that the “made in America” thing is a red herring at least in the case of the GL320 because the Mercedes GL-class is built in Alabama. I still get grief about this. But I know people still believe that a Dodge now owned by Fiat, or a Suburban built in Mexico, is more patriotic than a Mercedes made in Alabama, so that particular issue will probably dog me for years.) In any case, there should be more of these diesels from the big truck manufacturers, because they offer an excellent compromise between power and economy. Why should the only option for American diesel truck buyers be a 6.7 liter Cummins engine that makes enough noise to wake the dead, and only on the 2500-series trucks? The best thing about the GL320 is driving it while it’s not towing. I’ve never been a luxury car buyer before. I’m still not, really. If we had a shorter Airstream, I probably would have bought the VW Touareg 2 (now with 3.0 liter V-6 turbodiesel) instead. But since we needed the extra space and the third row seating, I can admit that the GL320 is a pleasure to drive when not towing. It is no sports car but just constantly reminds you that it is competent and safe. It is much nicer to drive and park than the Armada. Eleanor even likes to drive it, and she always hated driving the Armada. The safety features are extensive, so much that I can’t even get into them all here, but suffice to say it is in every way a safer vehicle for us to be driving. Finally, I love the fact that I’m getting nearly 600 miles from a $60 tank of fuel, versus 345 miles in the Armada, while putting out much less exhaust emissions. The worst thing about driving it is that it is so quiet and competent, highway drives are rather boring. I have discovered that I tend to get drowsy, which is definitely not a good thing with three and a half tons of RV behind you. I never had a tendency to fall asleep with the Armada. The solution has been to play music from the iPod. I guess in the big scheme of things, that’s not such a bad solution. I will tell you one last thing. A big part of my reasoning for buying this non-traditional tow vehicle is that I believe tow vehicles are headed in this technological direction. Rising CAFE (fuel economy) standards and rising emissions requirements will put huge pressure on traditional tow vehicle designs. Simply making trucks lighter won’t address the challenge — manufacturers have to make their vehicles smarter. I don’t think diesel is the whole solution either, but I do believe that a combination of technological advances (in body design, electronics, engines, transmissions, emissions controls, etc.) will lead us to the next generation of tow vehicles. I bought this vehicle partly because I think it represents the first wave of where we are headed as an industry (I’m speaking of the RV industry), and I wanted to get some experience with it to understand the future. If you wish to do the same, just remember that the leading edge is always sharp, so you need to be smart about your choices and do your research. The long days on the road are coming to a close, thankfully. Our drive from Columbia MO to Independence IA (300 miles) ended with a boom, literally. Less than 30 minutes after we arrived at the small city-run RV park here, a wave of intense thunderstorms passed through and terrorized us for a couple of hours. The clouds above were forming counter-clockwise swirls — a very bad sign — and the winds were strong enough to rock the trailer even with the stabilizers down. As always, when caught in bad weather, we began looking for an emergency exit, which in this case would have been a nearby brick shower house. Fortunately, the storms passed over us without causing any damage, and eventually left us with a gorgeous red and blue sunset, and fewer dead bugs plastered to the exterior skin of the Airstream. I am still talking to the manufacturer about the hitch problem we encountered recently, but since I’m getting “outed” left and right by my friends, I will go ahead and start acknowledging the new tow vehicle. It’s a 2009 Mercedes Benz GL320 with “Bluetec” engine. We chose this because it is a diesel 7-passenger SUV which meets our needs. We expect to use it for many years of towing. Sadly, with American and Japanese manufacturers pulling back on their promised diesel vehicles, the only diesel SUVs available new are coming out of Europe. VW, BMW, Audi, and MB all offer them today, while Nissan, Toyota, Chrysler, GM, and Honda have all announced light diesel programs and then canceled them. Fuel consumption: So far, with the engine still breaking in, we are getting 14.0 MPG towing at 60 MPH, flat to moderately rolling terrain, no wind. Going to 65 MPH costs us 1 MPG. I am told that the economy will improve as the engine breaks in. Still, that’s a solid 30% increase over the Armada. Loading: Yes, we are under the vehicle weight ratings. That includes Gross Vehicle Weight Rating (GVWR), and Gross Axle Weight Ratings (GAWR). The factory hitch is rated to 7500 lbs and 600 lbs of tongue, but we’ve substantially reinforced it, as readers of this blog know. I regard the factory hitch as inadequate for even the rated 600 lbs of tongue weight, so beware. Performance: The ride and handling are excellent, once hitched up properly. The interior is as quiet as you’d expect. Power is excellent, thanks to the diesel engine that puts out 398 ft-lbs of torque. It’s unbelievably quiet when running, to the point that many people don’t know it is a diesel. The 7-speed automatic keeps the engine in the ideal power band all the time. I think that once other manufacturers get their acts together, engine/transmission combinations like this will be the future of recreational towing. What I like compared to the Armada: Better fuel economy (22/28 MPG not towing), much nicer to drive especially when not towing, better towing handling at highway speed, high ground clearance when off-roading, extensive safety and security features, cheaper insurance, less propensity to roll over, much more powerful air conditioning, slightly more torque, diesel reliability and durability, 7-speed transmission, less frequent oil changes, longer cruising range, full-time AWD. What I don’t like compared to the Armada: Expensive to buy, slightly more expensive to maintain, no spare tire, less interior space, slightly less carrying capacity, too much tricky electronics, smaller sideview mirrors, limited third-row access, no aftermarket hitches, no low range, fewer service centers, expensive tires. Recommendation? : Most people travel with a ton of “stuff.” Most people never weigh their rig, either. For best value, largest cargo area, and less concern about overloading, go with a pickup truck. Seriously. For most people, that’s the right choice. Many of the SUVs require you to think carefully about what you carry, to avoid overloading the rear axle. The hitch design is inadequate, as I’ve already mentioned. There are no aftermarket hitches that fit this car, so you must buy the factory hitch — and even when you do get that option, you have to buy some wiring for the brake controller and there’s an additional charge to reprogram one of the computers so that the car will send signals to the brake controller. For me the icing on the cake was that the computer is so “smart” it won’t recognize a trailer with LED lights, so you have to go through some hoops to fix that issue as well. So with all those issues and limitations, you might wonder why I bothered with it. Why not buy a 2009 Dodge RAM 2500 4×4 with Cummins diesel with Megacab, for $56k? Well, some people like driving trucks, and some people don’t. As part of this exercise I have talked to quite a number of people who are currently towing with Mercedes (mostly the less expensive and smaller ML-class), and they all love them. I’ve also talked to many people who tow with big pickups and love them. To each their own, I say. Be safe, and have fun. I’ll report further on the performance of the Mercedes as we accumulate miles. The real proof of its appropriateness for the task will come only after many miles and (at least) several years of towing. Today we are going to check out a Frank Lloyd Wright house here in Independence, and then scoot up to Madison. There will be no escape from the heat, however. The “Airstream effect” has already begun. Whenever hundreds of Airstreams gather for the International Rally, the local area always experiences record high temperatures. The poor people of Madison WI have no idea what is coming, I fear. If we don’t hit 100 degrees during the rally week, it will be the first time in many years.